The Heard Museum offers a variety of specialized learning experiences for school groups, families and adult learners both at the museum and off-site. 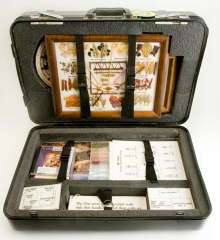 Additionally, a variety of resources are available for teachers who want to learn more about American Indian cultures and art and incorporate distinctive curricula into their classrooms. 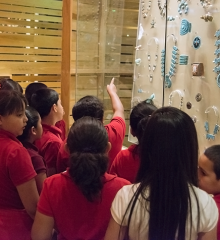 School tours are available for grades K-12 in several museum galleries. The Heard Museum offers hands-on children’s educational tours. We are able to accommodate individual visitors as well as groups of 10 or more in scheduling private docent-guided tours. Download supplemental curriculum materials and activity sheets. 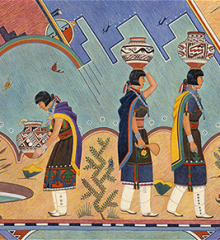 A variety of programs can be presented at your location, providing a richer understanding of American Indian arts and culture for all kinds of groups. 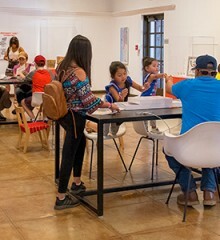 Hands-on galleries offer interactive fun for children, and kids-at-heart, while many of the museum’s events offer unique cultural learning opportunities for parents and children. Watch interviews, performances, and a video series that accompanies the Heard Museum’s signature exhibit, HOME: Native People in the Southwest.